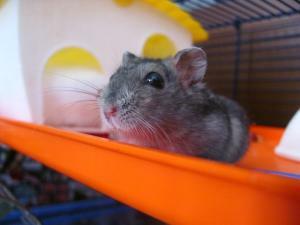 If you have small animals, you will know the importance of regular hutch and cage cleaning. While it probably isn’t something you look forward to, it’s a necessary evil for a happy and healthy pet. The longer the habitat goes without being cleaned, the more it becomes a breeding ground for bacteria. Over time, this can be harmful to your pet and to you (if the cage is kept indoors). But cleaning your pet’s cage needn’t be a chore. Keeping on top of its maintenance can save you both time and energy, which is especially helpful coming into winter. Some people prefer to clean their pet’s home daily by removing droppings and replacing bedding, while others opt for a thorough weekly clean. So, if you’re interested in finding ways to save time and make the cleaning process less unpleasant, read VioVet's top tips! If you prefer cleaning the hutch or cage out daily, make sure you remove uneaten fresh foods, including lettuce leaves, apple cores etc as these will spoil quickly and start to smell. Your rabbit/guinea pig/hamster will also get an upset tummy if they consume food that has passed its best. Spot clean the hutch or cage for piles of droppings, urine or water spillages and replace with new bedding. Some wood shavings clump together when soiled, which makes removing it a lot easier. Newspaper can also be replaced quickly if you start with a thick wad of paper and remove the sheets as and when they need changing. If you would rather clean the cage on a weekly basis, ensure you remove everything including newspaper, bedding, food bowls, toys and accessories, water bottles and hay racks. Use a dustpan and brush to collect up loose droppings and scrape away dried-on dirt. Once the area is clear, spray disinfectant around liberally, concentrating on the corners your pet visits most for the toilet. If you get a warm, bright day, use hot water, soap and a scrubbing brush to clean the hutch from top to bottom, rinsing thoroughly and allowing to dry with the doors open. If you do this, make sure your pet is carefully secured in an outdoor run or alternative enclosure. Clean and disinfect all feeding dishes and water bottles, as well as hay racks, toys and accessories if they are soiled. Use an old toothbrush for reaching into bowls and bottles and a sponge for wiping down toys. If you do use a disinfectant on these items, rinse them thoroughly before permitting your pet to go near them again. To maintain the cleanliness of the hutch or cage for longer, use a good absorbent bedding with plenty of newspaper underneath. Wood shavings are a good option as they are soft underfoot and have high absorbency. Although they are widely available, try to avoid shavings containing pine or cedar as they can cause respiratory problems in small animals. Because wood absorbs urine and quickly becomes damp, habitats with wipe-clean linings are best for easy cleaning. White vinegar mixed with hot water and/or linseed oil is a great cleaning solution for hutches and cages. It helps remove algae from water bottles and lifts urine and faecal matter from wood. It is also non-toxic and so appropriate for animals with allergies, sensitivities and respiratory complaints.